I am writing to you this morning to elicit your comments about the functionality of Monergism.com. Something designed five years ago on the Internet, as some of you know, is ancient by technical standards. It serves its purpose but it hitting up against its limitations and so needs to change functionally in order to grow and continue to serve its purpose with excellence. Please help us consider how we can improve the site and tell what you would like us to keep or throw away (functionally). To do this it is going to cost no small amount of change on our part but we think it is worth it if we are going to continue providing the caliber of materials that you are used to. Personally and above all, we would like the website to have more consistency, to be even easier to navigate and search so you can find what you are looking for. These all speak back-end functionally which are beyond my own technical ability so I have someone with a technical background to work with me to help put this together. We will take into consideration any of your suggestions, though in the end we may or may not implement them. Remember that we aggregate content from all over the web so the content is not ours. We cannot therefore add components such as "print page" and the like. Copyrighted material must stay on the server we point to. But other ideas are welcome. (1) Would you like to see a completely new look and feel, new colors etc.. i.e. would you like us to do a complete overhaul of the sites' look or would you prefer only a partial change of look? The reason I ask is because some persons have told me that we should maintain the overall branding look and feel ... but I want to see if this is the broad feeling of visitors or not. The cosmetics is not as important as usability and archtecture but we do want to know what you think about this. (2) When you surf the Internet, is your browser open all the way so it fills your whole desktop or do you surf with many windows you can see open on your desktop. This I ask because currently the site is optimized for 800x600 resolution. If you open your browser all the way then you are likely to see a lot of white space on the right side that goes unused. This is real estate we could use to have more content on a page. Should the site be wider to use this space? (3) What would make monergism.com a better experience as a visitor? (4) What would you like to see different? How could the site better serve your interests from a functional standpoint? Thanks, and feel free to offer constructive criticism. I personally believe the website is exceptional as it is. I agree with what you say above about keeping the overall branding and feel of the site. I am a frequent visior to Monergism.com and have come to have an appreciation and expectancy of where things are. However, this does not mean I would be adverse to changing things. I personally do not have the browser open to my full screen but keep the window fairly small. I know this input isn't much, but please continue to keep the content as organized as it is. And keep up the good work. All for the glory of God, of course! Get Tim Challies to do the overhaul. "Get Tim Challies to do the overhaul." I tend to agree with Andrew Wheatley. I spend about an hour each day reading from your website. I love it. It has been great. I was hoping to make a suggestion for a topic. I would like to see a section about Archeology. It would be good to see the role of it within Christianainity especially within Reformed Circles. I don't know much about this topic, so this is about all I can suggest. John - I will email you with my ideas. Let me first say that what you are talking about doing is work in information architecture. That is, how can we better structure the data (in this case through a web medium) to improve the product. This is professionally my specialty, and if you want to look into this as a framework, which can drastically improve the re-design process, then let me know. Of course, it would be my opportunity to give back what has been given to me. (1) I think it should be completely re-designed. Maintaing some of the branding is possible in a complete re-design. Grace Online Library is a good example of a site that did this. (2) The site has kind of a "frontpage" look to it (did you use FrontPage?). It would be better to (a) center the column or (b) design a fluid layout. I believe you can streamline your site to cut down on the inordinate amount of tables. (3) Gotta do something about that Iframe. There are plenty of alternatives to it. Also, I would improve the layout on the actual content pages. (4) Many of the problems I see with usability could be fixed with a re-design of the IA (see intro). I love to get info and encouragement from your website! I really like how everything is so categorized and organized. A new look?!! great! Same look?!! great! I really like the quotes at the top of the pages and the quick menu on the side. I like the introductions to the topics. I do use a whole screen to view, but I have a hard time reading on a computer screen so I print a lot of things out to read, especially if they are long. Thank you for such a terrific site! John, I have greatly enjoyed Monergism.com and your labor in maintaining this site, as has my family. Even in the US, some of us rural folk are stuck with dial-up internet. You can't control what is needed by articles you point to (though please keep us in mind when you have a choice of presentation), but as for the Monergism site itself, simple graphics and layouts are best for us! Use a single CSS-stylesheet that can be cached and used for the entire site, and keep your layout simpler. It is better to be navigate to a different fast-loading page than to wait for one real "busy" page whose layout is broken because something timed out. One thing that I really appreciate about the site is the ability to "browse" different topics, and to see some of your own commentary on those topics. Even if you use a database backend, I hope you can maintain this browsability, and your own comments. Maybe if you want to improve this part, a librarian would be able to give you more guidance than a web developer. One other feature (since you asked) would be to actually produce "study guides" in different areas of interest, with suggested articles, maybe some review questions or writing topics. This is where some of your readers could probably help, in suggesting articles and questions. Maybe you could even encourage readers who are writing essays in response to readings to post on their own blog, and have pointers to folks who are working their way through a study guide. (Maybe this part isn't done out of Monergism itself -- you would need controls over it, which probably goes beyond the scope of what one person could do.) Anyway, this would let those of us laymen who wish to study to grow in grace to get the benefits of some guidance. The "branding" of Monergism is your own to do with as you please. I kind of like the old pictures, quotes, etc. I never really use the drop-down widgets at the top, or the scrolling region in the sidebar. If you got rid of these, I'd still be quite pleased with the site. Sometimes I wish I could find the monthly "topic" page from a previous month. I like your monthly topic section, but will note it would be fine if that were a separate page, well linked from the main page. I hope these thoughts are helpful. I really do appreciate your labors. I spend a lot of time on the website and sometimes I not sure what next to read. Could you add a RSS (XML) feed just so we can know whats new. I know the frontpage does not change much but the "...This weeks features.." doeas change. I don't really mind the layout as long as I can find the link on the page. However you might want to consider changing the colours and fonts just to make it look different. Not sure I've been helpful but thats my 2Â¢. Place the google search bar at the top of the page. Scrolling down is never fun. First of all, let me express my heartfelt thanks for your commitment to the quality of Monergism.com over the years. I still remember wondering what in the world "monergism" was a couple years ago when Google brought up the site for my search on limited atonement. I'm so glad I clicked that link! The site has been instrumental in my gradual understanding and acceptance of Reformed theology. As far as improvements go, the only thing I've ever noticed is that I wish the links brought up in the site's Google search actually brought up the article rather than the topic page that the article is listed under. Sometimes they're still hard to find! First, THANK YOU for your faithfulness to provide excellent material for study, disicpleship, evangelism and worship todate. Second, I REALLY LIKE... 1)The monthly topics. I often use these as oppurtunities to stay current and read on the valuable doctrines. 2)The weekly features. I often use these for disciplship with friends. We each read one article and get together to discuss the article. Very helpful. 3)The listing of topics for me to look through. Third, I WOULD LIKE TO SEE... a montly church history or bio. 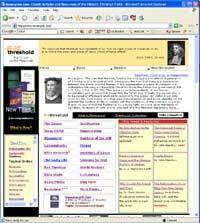 A list of article for a time period or person that has influenced the Church. 2) RSS feeds of the weekly features. 3)pictures of nature that scrolls with Scripture texts on each one. This will allow your site to have both general and special revelation displaying the glory of God. Fourth, POSSIBLE SUGGESTIONS... Look at the big sites that are doing what you are doing but on secular terms. The first example that seems to be the best fit is "wikipedia.org" another "theopedia.com" others sites that may not be as helpful but may give you some clues are "google" of course is the standard, "WebMD". There are others out there and you probably know more about those but these websites have set the standard and, in many ways, have created the way we think about websites and organization of lots of info. Just a thought but you guys have probably already thought about that. I've exposed my lack of technological savvy! Thanks for the suggestion. I say if it ain't broke, don't fix it. There's just so much right with the site but change is inevitable. We're so easily bored this side of heaven. Count on my prayers for God to guide you and for God to sovereignly guide the lost and hungry to your site to get fed. I think the website is great as it is in terms of content. When it comes to look and feel, I think it looks more nineties. I am a web designer and I tend to sway more towards having a website that is cleaner. Your site is a huge blessing to me, my wife and several co-workers of mine at Evangelical Christian Credit Union. I've appreciated the audio links the most and it would great to see these organized and emphasized a bit better. I love the feel of your site and actually have it set as my homepage. It always catches the eye of folks that stop by my desk at work. I love the weekly features and the Monthly Topics. I think you could improve the site by making the front page a bit less busy. Perhaps removing the column on the left and truncating the front page so that the monthly and weekly topics fit in the first screen view. Thanks for all you do Brother! This is my favorite web-site! I love the current website, like many other people have said they do. Navigation is much easier since the website has remained rather stable. Yes, the page is busy, but I think the set-up allows for organization without grouping too many subjects and options into one thing; I think simplifying the page (depening on how it is done) may make it harder to find a specific kind of thing from the front page. I don't think how busy the page is is bad. And the page looks quite attractive, interesting, and memorably distinct. A message board would be nice. I love the Website as it is, but I realise there is a time to keep up to date. It's a real blessing here in New Zealand. 2. Data-driven sites have the best design. 3. Single CSS is smart. 4. RSS is a simple way to keep the homepage fresh. 5. For your purposes flash would be a distraction rather than an addition. 6. Google search at the top of the page is very smart. 7. Dynamic table width to fit the browser maximizes the page. 2. If you stay light (small graphics, single css), you can dramatically simplify the view, having less content on each page (i.e. less scrolling), and greater ability for the user to locate content by a well-designed (and mulitply categorized) information architecture. Thank you for all you do - particularly the audio. It is a brilliant resource, that has grown me in love, worship and obedience to our great God and King. LOVE, LOVE the site. I am a daily visitor. However, I am not opposed to change. I really like access to the MP3 files. I'm not too techy, so a lot of this stuff other folks comment on are beyond me. I trust it will all work out well. (1) I would like to see a more uniform look across the sites you work with. This blog, Monergism and Monergismbooks should all have a similar feel to them, even if there are differences in colors or pictures. After all, they are in the same community. I would use the book site as a template and redesign Monergism around that theme, making changes as needed. Cross branding would add value to the community and show the consistency along your three main sites. Also, this blog needs to have a favicon like the other two. That goes with the branding. (2) Talk to Tim, he knows more about how to set up a website than I do, including the best practices. Having said that, I'll offer my opinions. On my computer, which is set to 1024 X 768 resolution, there is some white space to the right, but that is not a problem. I would rather have the space there than have a fluid layout. I have had fluid layouts before and run into problems with it. You have to determine which divs will and will not collapse, for example. Also, images can be murder on fluid layouts, giving a clunky affect. A background image or color with a centered content div gives you quite a bit of flexibility regarding width. Internet users have come to expect this in most cases. Both the book and the main site are fine for width, and the bordered look is attractive. It is certainly better than a page that is bursting with an overabundance of content. As long as the navigation is not too hard, you can reduce your links on the home page and have a less cluttered look. Whatever you do, minimize the number of people who have to scroll left to right! With less real content on the main page, you can draw greater attention to the current features. Another advantage of this concept is this: with the "height" of the content such that you can see half of the main page without scrolling, it becomes more user friendly. This is the same concept that a newspaper uses. The headlines are toward the top "above the fold" to catch the eye and get someone to want to read the story. The current site does a decent job of this above the fold, but it could be improved below the fold. Regarding RSS, that would be easy to do. You could either have a Monergism.com blog for the sake of announcing new articles and weekly/monthly points of emphasis or you could use Del.icio.us to tag each one as it comes in and use the RSS feed that is automatically generated. Regarding forums, please do not do that. I occasionally visit religious forums and they have a tendency to become quite polarized. Next thing you know, bloggers will be complaining about the unloving attitudes of those who have accosted them and will be linking to Monergism.com. To have a forum that would not turn out like this would require you and a few others to moderate with an iron fist, and you would be busier than you can imagine. I have moderated forums for a few sites and can say with all certainty that you really do not want to do this. I agree with Chris Poteet that you need to remove the iframe. There is a place for iframes, and that place is known as... this is a family friendly site, right? Regarding Shane's post, Amen, Amen and Amen! I don't use WebMD, but sites like Amazon and E-Bay manage to be user friendly and contain lots of info. For somebody who really doesn't know what to think, Lindsay has some fantastic ideas! I really like your site. You've done a lot of work in putting so many links and articles together and I could never thank you enough for making this available. It saves a great deal of time. However, I think it could improve some with an overhaul. Your database is SO extensive that it is somewhat overwhelming. A more defined menu system and cross-referencing would help. I think this could be done without taking away from the appearance. I'm not going to stop visiting if you don't overhaul it! Like the site, but I do think that it could be less cluttered. The information just jumps out and is overwhelming. I would like to suggest having some sort of search/browse function for a quicker way to locate information. I also think that it would be good to have the blog as a front page item. I think that would improve on some of the readership of current articles. I'd like to see it remain pretty much the same. I agree with "if it ain't broke, don't fix it." Not against change where needed, however, but bascially I like it as it is. I use a full page screen, so would like to see you keep that. Ditto the church history and bio suggestion. I love your site and it has been a blessing to me in my early stage of learning about reformed theology. If you are thinking of a way to organize content, I would suggest using a Content Management System (CMS). It will help put your content into organizable categories, it has its own search function, and it is dynamic and uses a database so that you don't have hundreds of .html pages taking up space on your server. The one that I love the most that I think will be most helpful to you is Joomla. It is easy to extend the capability of your website. If you don't want to use something that bulky, a much lighter CMS would be Limbo or you could use a the blog system Moveable Type which this site uses. I look forward to seeing what you do with Monergism.com. Personally, I like the current design, and find it easy to use. I would suggest incremental changes and improvements (though on the back end, change away!). First of all, thanks for all your hard work in providing a helpful, God-honoring, Christ-centered resource. I use Monergism.com all the time. It has been a real blessing to me and several of my friends. Regarding changes, please continue to allow things such as searching for articles by Scripture Reference. When I teach Sunday School, I tend to teach through specific passages of Scripture, and found this section of Monergism to be a great resource. It allows me to access commentaries without the cost-prohibitive investment of a complete library. My only suggestion was to provide a better way to find the relevant parts of an article when doing a Google search, as this has been nearly impossible to do at times. I see that you've already addressed this, but it is somewhat frustrating to know there's a relevant article from the Google search, but not being able to find it to access it. I haven't trie the toolbar highlight feature yet. On point 1: I like it just the way it is. I'm very used to it. I don't think anyone that is a regular visitor to your site is going to quit using it because you DON'T change the look. On the other hand, I bet you will loose some current visitors if you change it -- especially if you do a major overhaul. On point 2: My browser is open all the way. The white space doesn't bother me -- I've never noticed it until you mentioned it. Ain't that amazing? On point 3: I really can't think of anything. For the voluminous amount of material available on your site, I think you've already done a great job. Just one tiny thing - explain clearly what the Chinese symbols mean and why they're there. Otherwise - GREAT website! May our Lord bless you for getting this info out to the world! Wonderful website -- wish I had more time to read the articles than I do. I would like to see a less busy/cluttered home page. The search and "Start here" links should be at the top and more prominent so my Arminian friends who I direct to the site don't get overwhelmed. And too many portraits of those stern reformation guys may scare them off too. Wow ... I want to thank you all for continuing to bring out the many excellent suggestions. We are delighted to hear what you think about the site and how it could improve ....and we will look forward to implementing many of the suggestions. Like you, we have no real desire to make it flashy or have useless animations but are mostly interested in simplicity, usability, information architecture, search capability, page download speed and navigational ease so that users have a better experience when visiting the site. The content focus will largely remain the same and continue to grow but since this is a long term project we want the website to create the best experience for the community of users. I think a whole new look would be nice. I am always up for change. I would like to see more quotes from famous Monergists. That is one of my favorite things about your site. Just wanted to thank you for posting my Propitiation article under the index on Atonement. [As per] your questions on the blog on how improvements might be suggested. I have to say that I thoroughly enjoy the Monergism site just as it is and lean towards maintaining the overall branding look and feel. That is my opinion but I have friends who frequently visit the site and would also echo my sentiment. I believe the site is excellent just the way it is. Thank you again brother. I like monergism.com the way it is, but I do understand the desire to unclutter the front page. I do remember my first exposure to to this wonderful site. I was overwhelmed by it all. The "Start Here", perhaps, needs to be emphasized more. In any case, please keep up the good work. I love the site! My wife and I were discussing it though, and we thought it looks to busy or cluttered (she said she finds it very hard to navigate). I am able to find most of what I am looking for quickly, but I was wondering if there is a way when you do a search on the site that it takes you to an exact article. When I find an article that sounds interesting it always takes me to that category and I have to scroll through all the articles to try to find it. This is a bit difficult and does bother me. With that said, all in all the information you supply and the site is excellent. By the way, Monergism Books is great as well. Keep up the good work. You and your site are in my prayers. (1) I'm a substance over style guy, so . . . . if it ain't broke, don't fix it. But . . . . you are the artist, so . . . . I'd go with what you feel inspired (non-Biblically speaking) to do! (2) I keep my resolution at 1024 x 768, but the white space doesn't bug me. I'd say my comments above apply here, too. (3) For me, the key is content, content and content. Sometimes, the links that you have just don't work anymore. In that regard, I would ask friends (you could count me in that group!) to be responsible to regularly check the links for a page or two every week or so. That way, you would avoid stale links. As you know, I am a big fan of your ministry. I pray that God will continue to bless you and this ministry with great fruitfulness to HIS great glory! 1) I personally still like the style of the site. If it has to be changed that's fine, but I believe it would be fine if you left it as it is. Architecturally, I like the way it is laid out. 2) My screen resolution is 1280x1024, but I like the current screen format of the site because I can adjust the browser size so the website fits into the browser window and doesn't take up the whole screen (hope that made sense, if not just email me and I'll try to explain more thoroughly). 3) I love the content on the site as it has been such a great tool for me personally as well as the high school ministry I volunteer with. I am in agreement with Ted Hoffman on the links issue. Is there someone besides you, John, we can send dead links to at present? I don't want all of us to overwhelm you or them with emails about dead links, but we would like to help you out in any way we can. I appreciate your ministry and praise God for using you in this service to further His kingdom and the cause of the Gospel. Praise God for Jesus Christ, His death and resurrection for our sins. This is my home page, read it and use it for planning bible studies I teach. Only thing I would add would be a search engine for the site, so we might find specific phrases or words in articles. Don't make big changes, it is very efficient as is, just a reformed library right at my fingertips. It is the best Christian site on the web!!!!! I spend a lot of time on the web, including having designed and run websites. The layout and window are fine. The website is a great help to me when looking up data for school and counseling. thank you for taking your time with this site. The only thing I find difficult or would like to see changed about the site is I find the front page a little busy. I have learned to use the topical index on the left to naviate around the site as I need to. BTW my screen is set for 1680 x 1050 and I see a good bit of white while mazimized, but that is probably do to my monitor size. Honestly I love the site in the shape, size and performance the way it is and it serves a very good purpose. thanks again.